Be harmonious with your mind and body to the environment. Be energised by the effects of the 5 Elements in alignment with your internal organs. Be in-tune with the Universe. Enjoy good health and well-being. The 108 movement traditional Yang Style Tai Chi Form choreographed by Master Yang Ching Po will be taught in 3 segments. 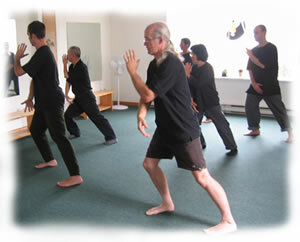 In Segment 1 students begin with the 4 basic "Tai Chi Qigong" movements and the first simple 18 movements of the Form. Segment 2 teaches the next 37 movements and is a little more demanding. Segment 3 picks up the momentum and completes the whole 108 movements of the Form. Students will progressively gain a better knowledge of Tai Chi and improved health (both mental and physical) throughout the practise of the program. The martial intent of Tai Chi is considered but not emphasised.